In 2003, Budden released his debut solo studio album, Joe Budden. It included Budden's 2003 Grammy-nominated summer hit "Pump It Up", and was also featured in the soundtrack for the movie 2 Fast 2 Furious  and the video games Def Jam Vendetta, Def Jam Fight for NY, and Madden NFL 2004. 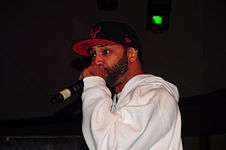 The song "Focus" was also featured in the game and Budden was also a character. Its second single was "Fire" featuring Busta Rhymes, which was in the movie Mean Girls. The song "Drop Drop" was featured on the soundtrack for the movie Cradle 2 the Grave, and the video game NBA Live 2003. Budden has hinted in many songs that he was a recovering drug addict and has reaffirmed his position several times through multiple outlets. Budden hosts his own podcast called I’ll Name This Podcast Later with much success. He is preparing to release a new project with araabMUZIK called Rage and The Machine and another Slaughterhouse. He announced his last tour dates on May 16, 2016. ↑ Jason Birchmeier. "Joe Budden - Music Biography, Streaming Radio and Discography - AllMusic". AllMusic. Retrieved March 11, 2015. ↑ Birchmeier, Jason. "Joe Budden Biography & Awards". allmusic. Rovi Corp. Retrieved July 18, 2012. 1 2 3 Bottomley, C. (May 5, 2003). "Joe Budden: Pump up the Volume". VH1. Viacom International Inc. Retrieved July 19, 2012. ↑ Bush, John. "Original Soundtrack 2 Fast 2 Furious". allmusic. Rovi Corp. Retrieved July 21, 2012. ↑ "Def Jam Vendetta Original Soundtrack". VGMdb.net. Jelsoft Enterprises Ltd. Retrieved July 21, 2012. ↑ "Joe Budden leaves Def Jam". Yorapper.com. October 10, 2007. Retrieved February 27, 2011. ↑ "New CD's". The New York Times. January 16, 2006. ↑ "Joe Budden Signs with Amalgam Digital, Preps Retail Release of Mood Muzik 3 - XXL". Xxlmag.com. December 26, 2007. Retrieved February 15, 2013. 1 2 "FEATURE: Crooked I, The Freestyler[Definitive Dozen] | Hip Hop On A Higher Level". Xxlmag.Com. Retrieved February 27, 2011. ↑ "Slaughterhouse". Allmusic. Retrieved March 30, 2012. ↑ Kuperstein, Slava (August 10, 2009). "Slaughterhouse - self-titled | Read Hip Hop Reviews, Rap Reviews & Hip Hop Album Reviews". HipHopDX. Retrieved February 27, 2011. ↑ RealTalkNY (January 12, 2011). "Eminem Officially Signs Slaughterhouse & Yelawolf To Shady Records | RealTalkNY". Realtalkny.uproxx.com. Retrieved February 27, 2011. ↑ "Mixtape Release Dates: Joe Budden, Wale, Pusha T, Young Jeezy". HipHop DX. Retrieved November 19, 2012. ↑ "Joe Budden - A Loose Quarter Hosted by Mood Muzik Ent // Free Mixtape @". Datpiff.com. November 20, 2012. Retrieved February 15, 2013. ↑ Ryon, Sean (November 28, 2012). "Joe Budden Announces New Single With Wiz Khalifa & French Montana "N.B.A. (Never Broke Again)" | Get The Latest Hip Hop News, Rap News & Hip Hop Album Sales". HipHop DX. Retrieved February 15, 2013. ↑ Edwin Ortiz. "Joe Budden Plans to Release New EP & Album This Year". Complex. Retrieved March 11, 2015. ↑ "Joe Budden opens his depressing diary on 'Some Love Lost' (album review)". cleveland.com. Retrieved March 11, 2015. ↑ Schwartz, Danny (2015-07-01). "Joe Budden Announces Release Date For "All Love Lost"". Hotnewhiphop.com. Retrieved 2016-04-07. ↑ Trevor Smith. "Joe Budden Loses "Total Slaughter" Battle Against Hollow Da Don [Update: Watch The Battle]". HotNewHipHop. Retrieved March 11, 2015. 1 2 3 NavJosh (May 16, 2016). "Budden announces last tour dates". hiphop-n-more. Retrieved May 16, 2016. ↑ "I'll Name This Podcast Later Episode 71". ↑ "XclusivetraX presents - Joe Budden - At Home w/ Girlfriend and Son". xclusivetrax.com. Retrieved March 30, 2012. ↑ Conte, Michelangelo. "Jersey City rapper owes $13K in child support, sheriff's office says". NJ.Com. NJ Advance Medai. Retrieved June 27, 2016. ↑ "22. Joe Budden Misses Concert Because of $75 Parking Ticket — The 25 Biggest Hip-Hop Fails of 2012". Complex. Retrieved February 15, 2013. ↑ "Wanted rapper, Joe Budden lashes out at NYPD". Fox News. Retrieved March 11, 2015. ↑ "Video: Joe Budden Speaks On Molly Addiction". RealTalk NY. Retrieved March 11, 2015.